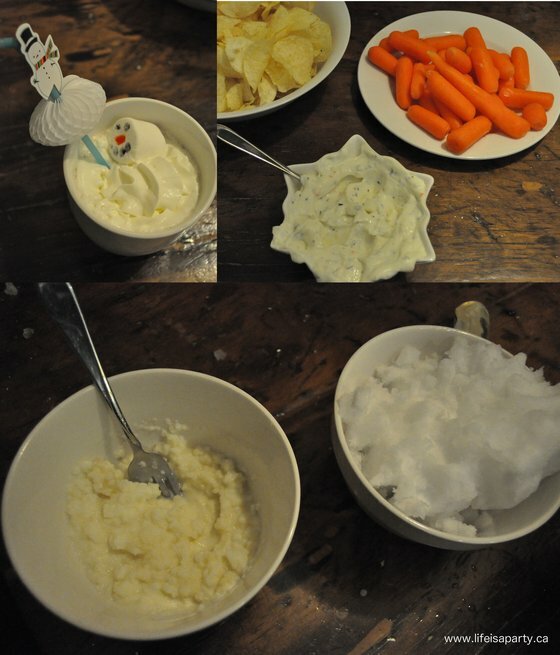 Snowman Dinner -easy snowman dinner with snowman tablescape, and menu, kids will LOVE, perfect for a family dinner. It’s January and there’s lots of snow around here. So in the spirit of “love the one you’re with” and since we’re with snow, lots of snow, we had some friends over for a little snowman dinner the other day. It was a Friday night affair that was pretty simple to put together and a lot of fun. My girls and I put together a fun and easy snowman table. 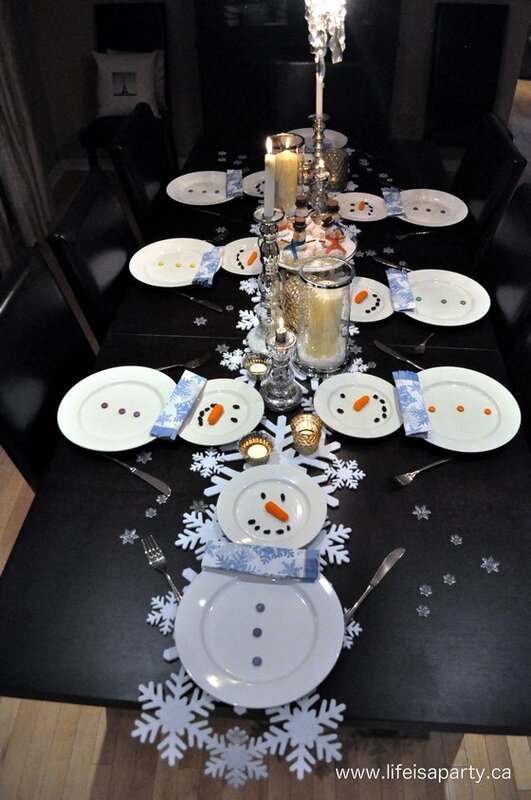 We made snowmen for the table with our regular white dinner plates and side plates. We made scarves out of napkins. The face was a baby carrot nose, and raisin eyes and mouth. We used smarties for buttons, and positioned the fork and knife as arms. Simple and sweet. The kids loved it. 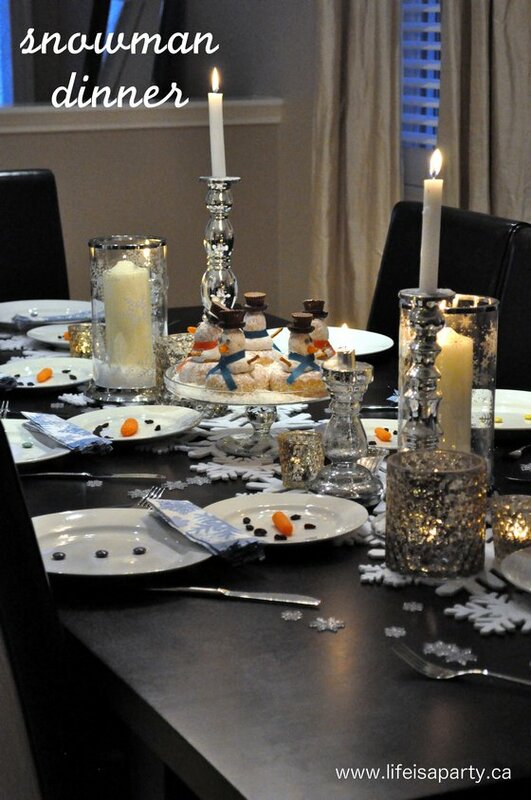 I used a pretty snowflake runner, and some snowflake confetti on the the table. I also used lots of candles for a warm glow on this cold winter night. The centre piece was our donut snowmen, that we shared here. We added a few other snowman themed elements to the night for fun. We started the evening off with some dip and “snowman noses”. It was “make your own pizza”, so we had things like olives, mushrooms, zucchini and pepperoni for everyone to make their snowman face pizza -they looked cute with a white mozzorella base. I made the kids some snowman hot chocolate to drink. We started out with white hot chocolate, and added whipped cream, and marshmallows that the kids made snowman faces on with edible markers. For dessert we had our donut snowmen, along with some snow ice cream. See how we made it last time here, but this time we used an even easier method – just combine snow with sweetened condensed milk, we used a few tablespoons per bowl. It was fun and very yummy. We had a really fun night, and it was easy and very do-able even at the end of a long week. I hope it inspires you. 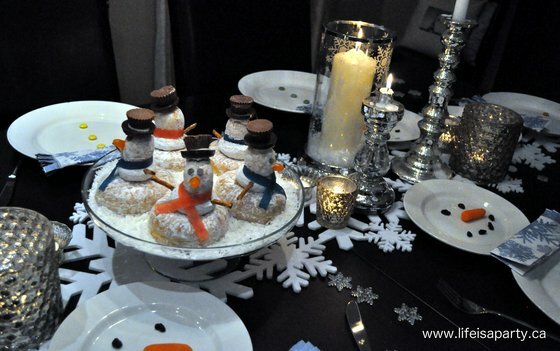 With a snowman dinner with friends, life really is a party! Love this idea so much! 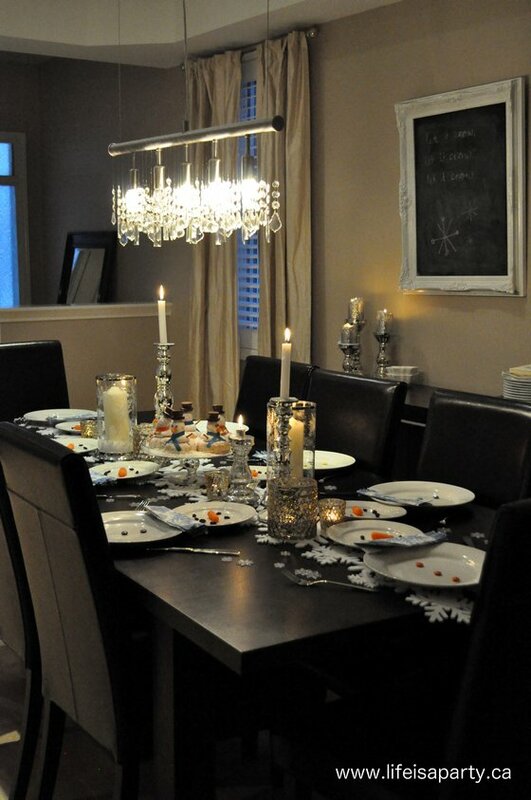 Very cute, but not too difficult, and you carried the theme all the way through:)The place settings look adorable! Super cute! I really love the silverware-as-snowman-arms! Clever! And the doughnut snowmen are darling! I know the children, especially, were thrilled, but I’ll bet even the grownups smiled! This is such a creative table! The plates are adorable as are the donuts. So fun! What a cute table! 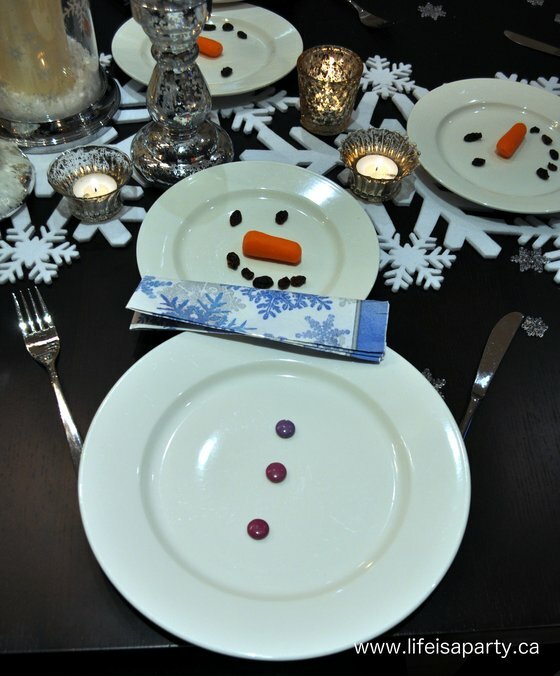 Love the snowman designed plates! My mom collects snowmen so anything with snowmen usually catches my eye. This was so cute. Very fun. Julia, I’ve been having a rough day. Thanks so much for your kind comments. You made me smile. Ok, that seriously looks amazing! They are so lucky to have you as a Mom.